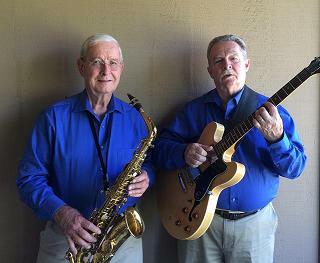 Mellow Fellas is Norm Gary on clarinet, sax and flute, and Bill Rowland on vocal and guitar. Together we have almost a century of professional music experience, in a wide variety of styles and venues. Our repertoire includes songs of the Roaring 20s, tunes from the Great American Song Book (Gershwin, Ellington, Cole Porter, etc. ), mellow pop ballads from groups like The Beatles, up through songs from current artists such as Billy Joel and Norah Jones. We are available for performances in the Sacramento, California area. We enjoy performing at wineries, receptions, pizza parlors, fine dining, farmers' markets, and many other venues. Our music is especially popular with seniors. They remember when the older songs were "top 40" hits, and not "golden oldies"! And don't let the word "mellow" be TOO deceiving. Unless requested otherwise, we do keep our playing volume low, but we have plenty of upbeat tunes, with Norm showing off his Dixieland "chops", and Bill throwing in some hot guitar licks! We can change our performance as needed for each event. Sometimes we provide background music, but we can also perform in an entertainment mode, with some witty (?) patter, information about our songs, or other entertaining comments. We love tunes that encourage audience participation such as dancing or singalongs. We hope you will consider the music of Mellow Fellas for your upcoming events in the Sacramento area! Norm has performed for more than 30 years in the Sacramento area. He was leader of the Beez Kneez jazz band as well as many combos. He played with the Riverbank Blues Band and JM Jazz. He is currently a member of Dr. Bach and his Jazz Practitioners, a very popular Sacramento jazz band. Since 1979 he has played every year in the Sacramento Jazz Jubilee (now known as the Sacramento Music Festival). Norm is a gold card member of the Sacramento Traditional Jazz Society. He also performs (on clarinet) with the Sacramento Banjo Band and was sound engineer for their recordings. In addition to his music, Norm (or rather, Dr. Gary) had a fascinating career as a university professor, research scientist, author, and is one of the world's leading authorities on honey bee behavior. For more than 40 years he was Hollywood's "bee wrangler", doing "bee stunts" for many movies, commercials, and national television shows. Visit Norm's web page for more details on his interesting career. Bill has had a varied musical career over the past 40+ years. He left college during the hippie era, and played full-time with a touring rock band for a few years. He then went back to school and received his Bachelor of Music Education degree with an emphasis in guitar from the University of Northern Colorado, and spent several years teaching public school music and private lessons. Bill has performed in a wide variety of different styles and venues: club bands playing jazz, rock and country, community concert and jazz bands, church and community choral groups. Although he prefers to have Norm join him, Bill still does some of his Mellow Music solo performances. And he is a founding and current member of Vinyl Destination, a classic rock band, singing and playing guitar and keyboards. Bill has recently retired from a 35-year career as a software engineer, and now devotes his time to music and his grandchildren and family. They just don't write them like this anymore!